If you’re a runner, you’ve likely heard that cross training is something you should add to your training routine. But, how should you add cross training to your routine? And what types of cross training for runners are best? 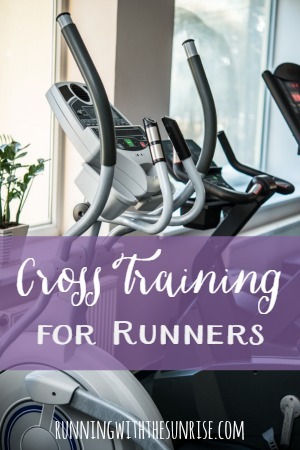 Keep reading to learn all about cross training for runners and how to become a better runner through cross training! A strict definition of cross training for running is any cardiovascular activity that keeps your arms and legs moving in a similar motion as they would during running, that is, front to back. Activities that would fall under this definition of cross training would be fast walking, biking, using the elliptical machine, stair climbing, etc. These activities allow you to use your muscles in a similar way as you would during running. However, a more casual definition of cross training includes activities that help improve overall fitness and strength. Activities that would be considered cross training under this broad definition would be yoga, pilates, kickboxing and various strength training activities, including weight lifting and CrossFit. Why should runners cross train and how do you do it? Why should you cross train? Simply put, cross training can help you become a stronger, more resilient runner. Cross training activities such as cycling or using the elliptical will help you improve your cardiovascular fitness without putting more impact on the joints, which will help reduce your risk of getting injured. Cardiovascular cross training is especially important for injury-prone runners for this reason—you can improve your fitness with low-impact activities, helping you become a better runner without as much pounding. Including activities that increase strength and flexibility in your training routine will also help reduce the risk of injury by making sure that you strengthen the muscles that help stabilize you as you run. You’ll also reduce the risk of your muscles becoming unbalanced in strength, which can also lead to injury. I had to go through physical therapy for a hip flexor injury a couple of years back, and several of the exercises my PT had me do to strengthen my stabilizing hip muscles are the same or similar to the things I do in my yoga and barre classes. What kinds of cross training are good for runners? Cycling, Elliptical – As I mentioned before, runners will get the best benefits out of activities that physically mimic running but without the impact of running. You’ll work major muscle groups in a similar way as you do when you run, but your risk of getting injured will be much lower. Yoga – If you’ve read my blog at all you know that I am a huge fan of yoga for runners for many reasons. You’ll get stronger, strengthen those stabilizing muscles, work your core, and you’ll get many mental benefits that you can apply to your running, too. Strength Training – Again, making sure that your muscles are strong will help you maintain proper running form. Strengthening all of your muscles will also help prevent imbalances from popping up, and those imbalances can easily lead to injuries. Runners should be doing some sort of strength training, whether it’s through body weight exercises or with actual weights. Barre – Barre classes, like yoga, will help you strengthen those hip stabilizing muscles and will help you strengthen your core, too. If you’re only running, those hip and glute muscles tend to get weak, which barre classes really focus on and are great for strengthening. The added strength will help you keep good form as you get tired on your runs. I hope I’ve convinced you runners that you should add in some cross training to your training schedule! Cross training for runners has so many benefits that you really have nothing to lose. If you’re not cross training already, start by adding in one cross training session a week and add in sessions from there as your body adapts to the extra work. Good luck and feel free to contact me with any questions you might have about cross training! Runners: Do you cross train? What’s your favorite kind of cross training? Testify! How has cross training helped your running? « Motivation Monday #35: Who’s Your Competition? And lifting is great for runners! There are muscles that can easily get weak if you just run, leading to injury. Keep everything strong for marathon training–it will help you get to that finish line! I’m all about strength training! Since I started lifting weights and doing CrossFit, my running has gotten SO much stronger! I’ve shaved 9 minutes off my half marathon time! AWESOME! Strength training can do so much for runners. Thanks for sharing your experience! I don’t know how some people run the way they do without cross training. It boggles my mind. Marathon training for me is a careful orchestration of cross training and running. And they are each as important as the other! I did it. And then I got injured. Seriously, too much of moving muscles in the same way will lead to injury. Better to switch things up! I have! I tried PiYo a couple of years ago and liked it–killed my core, in a good way! Ugh, the dreaded weak hips/glutes. That should be my middle name and hence why I really need to take this advice seriously! I keep saying I wanted to try barre but I didn’t think about how it would really help with my weak glutes. Oh yes, there is much targeting of the glutes. And why I’m so sore–my runner glutes got so weak and I’m trying to get them back into shape! I love that my OTF classes force me to do some strength training. I was never good at keeping up with cross-training until recently – I loved ballet, but when I started running, I pretty much kept it to stretching and maybe 10-20 mins of Youtube yoga! But then I found November Project, where strength training is interspersed with speedwork and running, so I rely on them to stay on track. And it’s usually enough…this morning was a total of something like 70-80 each of burpees, push-ups, sit-ups, and mountain climbers. Nice! I bet you are STRONG now! I’ve been trying to get more consistent about crosstraining, but it seems like I can only squeeze in so many workouts each week. I’ve been dabbling in at home cross training and that has helped. I hear ya–never enough hours in the day to do everything you want to do. Seriously, every little bit helps, even if it’s a few minutes of building strength. Very educational and well-written post, Beth! Loving these ideas. Oh, YES! CrossFit is for strength and conditioning! I believe it’s the most effective fitness training and you lose weight fast!